eye care resources needed to ensure healthy eyes. If you are hoping to continue to enjoy good vision for many years to come, be sure you take the following protective measures to help keep your eyes safe and healthy. Reach out today to learn more about how visiting your eye doctor can improve your chance of having good vision throughout your future. While we often think of sunglasses as a practicality, helping us see the road when we are driving on a sunny day, they do so much more. Sunglasses offer protection for your eyes even if you aren’t feeling the effects of the sun. Make sure that you choose a pair of high-quality sunglasses that provide UV protection. Be wary of any cheap knock-off sunglasses as they often do not protect your eyes against UV rays. Cheap sunglasses can, in fact, harm your eyes more than help them. The key to getting the most out of your sunglasses is to use them constantly. Whether you are out for a run on a sunny day or you are making a quick trip to the store, anytime your eyes are exposed to the sun you should wear protective glasses. There are numerous occasions where it is wise to utilize eye protection. From working on a carpentry project at home to using harsh chemicals at work, if there is any chance that a harmful substance or particle could enter your eyes, wear protective goggles. While you might not love the style of eye protection, you will be glad that you took proactive measures should something fly toward your eye. There Is A Risk Of Projectiles: This might include metal, wood, dust, and any other small particle. Usually, projectiles are a risk when you are cutting a material. There Is A Risk Of Chemical Exposure: Chemicals can splash into your eyes and fumes can cause damage. Be sure to wear protective goggles when working with any chemicals that put your eyes at risk. There Is A Risk Of Exposure To Radiation: Whether it is exposure to lasers, ultraviolet radiation, or another form of radiation, be sure you wear the proper protective gear. Do you enjoy going for a swim? Perhaps you swim laps for exercise or love visiting the beach for vacation. Whenever you take part in this wonderful activity, be sure to wear swimming goggles. These goggles will help keep harmful substances out of your eyes. In the case of a swimming pool, the chlorine and chemicals used in the water can cause damage to your eyes. When it comes to the ocean, not only can the salt hurt your eyes, but sand and other particles in the water can as well. Touching and rubbing your eyes can transfer foreign particles into your eyes. In some cases, rubbing your eyes will cause germs and bacteria to enter the eye. 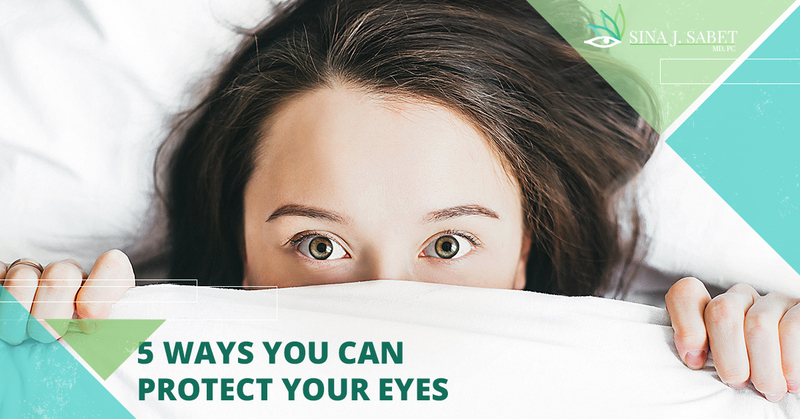 Next time you feel tired or your eyes are bothering you, avoid rubbing them. If you need to touch your eye or remove debris from your eye, be sure to wash your hands thoroughly before doing so. Finally, one of the best protective measures you can take for your eyes is to schedule an annual exam with your eye doctor. This will allow you to catch any issues with your eyes early on. If you already wear glasses or contacts, frequent checkups will ensure that the prescription you have is still correct. If it has been a while since you have last visited an eye doctor in Alexandria, we invite you to make an appointment with our team. We can help you learn how to best take care of your eyes to contribute to longevity and health. Book your appointment today.